In case you are a retailer interested in purchasing our products, or opening a franchise store in any country, please contact one of our international officers. 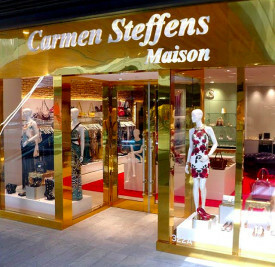 We thank you very much for your interest in Carmen Steffens International franchise or distribution opportunities. Founded in 1993 by economist Mario Spaniol, who is still the company's president and CEO, Carmen Steffens is located in Franca, São Paulo. Carmen Steffens has become one of the most desired domestic brands and is now the fastest international growing Brazilian fashion label. In June 2014, Carmen Steffens received, for the second time, the award "BEST FRANCHISE OF BRAZIL" among the footwear, clothing and accessories segment; awarded by the magazine "Pequenas Empresas & Grandes Negócios", one of the most important Brazilian business magazines.